For other uses, see Geek (disambiguation). The word geek is a slang term originally used to describe eccentric or non-mainstream people; in current use, the word typically connotes an expert or enthusiast or a person obsessed with a hobby or intellectual pursuit, with a general pejorative meaning of a "peculiar person, especially one who is perceived to be overly intellectual, unfashionable, boring, or socially awkward". Some use the term self-referentially without malice or as a source of pride, often referring simply to "someone who is interested in a subject (usually intellectual or complex) for its own sake". Nonetheless, it remains a pejorative, widely used in an abusive manner especially against children and teens who may be more focused on studies, while less popular, fashionable, or socially inclined. The word comes from English dialect geek or geck (meaning a "fool" or "freak"; from Middle Low German Geck). "Geck" is a standard term in modern German and means "fool" or "fop". The root also survives in the Dutch and Afrikaans adjective gek ("crazy"), as well as some German dialects, and in the Alsatian word Gickeleshut ("jester's hat"; used during carnival). In 18th century Austria, Gecken were freaks on display in some circuses. In 19th century North America, the term geek referred to a performer in a geek show in a circus, traveling carnival or travelling funfair sideshows (see also freak show). The 1976 edition of the American Heritage Dictionary included only the definition regarding geek shows. [clarification needed] This variation of the term was used to comic effect in an episode of popular 1970s TV show Sanford & Son. Professional wrestling manager "Classy" Freddie Blassie recorded a song in the 1970s called "Pencil-Necked Geek". The 1975 edition of the American Heritage Dictionary, published a decade before the Digital revolution, gave only one definition: "Geek [noun, slang]. A carnival performer whose act usually consists of biting the head off a live chicken or snake." The tech revolution found new uses for this word, but it still often conveys a derogatory sting. Today, Dictionary.com gives five definitions, the fourth of which is "a carnival performer who performs sensationally morbid or disgusting acts, as biting off the head of a live chicken." The definition of geek has been used as slang with different connotations, including as an affectionate label. However, this doesn't mean that the term is meaningless or has lost its meaning over time. It remains mostly a derogatory term used to label people unfairly and offensively. Not a friendly and affectionate compliment about somebody's personality, but a hurtful insulting form of invalidation or emotional abuse. The term nerd has a similar, practically synonymous meaning as geek, but many choose to identify different connotations among these two terms, although the differences are disputed. In a 2007 interview on The Colbert Report, Richard Clarke said the difference between nerds and geeks is "geeks get it done" or "ggid". Julie Smith defined a geek as "a bright young man turned inward, poorly socialized, who felt so little kinship with his own planet that he routinely traveled to the ones invented by his favorite authors, who thought of that secret, dreamy place his computer took him to as cyberspace—somewhere exciting, a place more real than his own life, a land he could conquer, not a drab teenager's room in his parents' house." Geeks are often associated with an abnormal appreciation for mathematics. 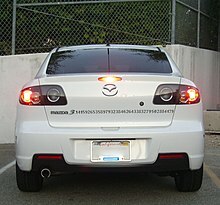 Here, an approximation of the number π (pi) extends from the logo of a Mazda3, parked at University of California, Irvine. Technologically oriented geeks, in particular, now exert a powerful influence over the global economy and society. Whereas previous generations of geeks tended to operate in research departments, laboratories and support functions, now they increasingly occupy senior corporate positions, and wield considerable commercial and political influence. When U.S. President Barack Obama met with Facebook's Mark Zuckerberg and the CEOs of the world's largest technology firms at a private dinner in Woodside, California on February 17, 2011, New York magazine ran a story titled "The world's most powerful man meets President Obama". At the time, Zuckerberg's company had grown to over one billion users. According to Mark Roeder the rise of the geek represents a new phase of human evolution. In his book, Unnatural Selection: Why The Geeks Will Inherit The Earth he suggests that "the high-tech environment of the Anthropocene favours people with geek-like traits, many of whom are on the autism spectrum, ADHD, or dyslexia. Previously, such people may have been at a disadvantage, but now their unique cognitive traits enable some of them to resonate with the new technological zeitgeist and become very successful." The Economist magazine observed, on June 2, 2012, "Those square pegs (geeks) may not have an easy time in school. They may be mocked by jocks and ignored at parties. But these days no serious organisation can prosper without them." For the book, see Geek Chic. "Geek chic" refers to a minor fashion trend that arose in the mid 2000s in which young people adopted "geeky" fashions, such as oversized black horn-rimmed glasses, suspenders/braces, and highwater trousers. The glasses—sometimes worn with non-prescription lenses or without lenses—quickly became the defining aspect of the trend, with the media identifying various celebrities as "trying geek" or "going geek" for wearing such glasses, such as David Beckham and Justin Timberlake. Meanwhile, in the sports world, many NBA players wore "geek glasses" during post-game interviews, drawing comparisons to Steve Urkel. The term "geek chic" was appropriated by some self-identified "geeks" to refer to a new, socially acceptable role in a technologically advanced society. ^ a b "Geek". Dictionary.com-Merriam-Webster entry. Retrieved January 2, 2016. ^ Olivri, Thomas (November 4, 2014). "Geek-Art: An Anthology: Art, Design, Illustration & Pop Culture". Chronicle Books. p. 4 – via Google Books. ^ Berlatsky, Noah (January 31, 2013). "Why Geeks Get Bullied (It's Not Necessarily for Being Geeks)". The Atlantic. ^ "Duden | Geck | Rechtschreibung, Bedeutung, Definition, Synonyme, Herkunft" (in German). Duden.de. October 30, 2012. Retrieved June 30, 2014. ^ "Geek". Online Etymology Dictionary. Retrieved May 3, 2013. ^ "Dictionary.com: Geek". Retrieved May 10, 2017. ^ Kaestle, Thomas. "The story of Traceroute, about a Leitnerd's quest". Boing Boing. Retrieved January 28, 2019. ^ Beckett, Jamie (October 24, 2012). "Study shows Stanford alumni create nearly $3 trillion in economic impact each year". Stanford News. ^ Amira, Dan (February 18, 2011). "The world's most powerful man meets President Obama". New York Magazine. ^ "Geeky Becks' specs appeal". The Sun. September 12, 2010. Retrieved March 1, 2013. ^ "Nice glasses! Justin Timberlake is bringing geek chic back at the Social Network premiere". Daily Mail. September 25, 2010. Retrieved March 1, 2013. ^ "Whacky NBA Playoff Fashion!". YouTube. Retrieved June 26, 2012. ^ Cacciola, Scott (June 14, 2012). "NBA Finals: LeBron James, Dwyane Wade and Other Fashion Plates of the NBA Make Specs of Themselves". Online.wsj.com. Retrieved June 26, 2012. ^ Lambert, Katie. "How Stuff works: Geek Chic". People.howstuffworks.com. Retrieved June 30, 2014. Look up geek in Wiktionary, the free dictionary. Wikimedia Commons has media related to Geeks. Geek Culture: The Third Counter-Culture, an article discussing geek culture as a new kind of counter-culture. The Origins of Geek Culture: Perspectives on a Parallel Intellectual Milieu, an article about geek culture seen in a cultural historical perspective. Hoevel, Ann. "Are you a nerd or a geek?" CNN. December 2, 2010.